GrapeFever founder. Born in Illinois but full blooded porteña. After living back and forth in the US and Argentina for 14 years, she finally settled in the city she calls home, Buenos Aires. She is a hotelier and sommelier (oh la la!). After receiving a Degree at the California Culinary Academy in Hotel and Restaurant Management she worked at the French Laundry, where she grew an appetite for exquisite food and wines. From Assistant Manager to Manager at various Hyatt Hotels in California and Director of Banquets and Events team at the Carmel Valley Ranch in Carmel Valley, CA. 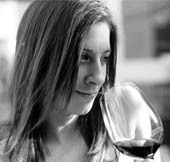 After passing her Certified Sommelier Exams and studying at the Escuela Argentina de Sommeliers, she decided to devote her time to the communication and education on wines. In 2010 she founded GrapeFever, a company dedicated to the communication and information on Argentine Wine and Culinary Culture. Sommelier. He was born in chilly Alaska, and first exposed to wine when his family relocated in the heart of wine country in Sonoma County, California. However, it wasn’t until he moved to Argentina in 2005 that his full-blown wine love affair began. After receiving a Masters in Communication from the Universidad de San Andres, he studied at the Escuela Argentina de Vinos, traveled through the different wine regions in Argentina and worked as a Sommelier at a Boutique Wine Hotel. He dares people to go beyond the Malbec and try a racy Torrontes from the highest vineyards in the world, a sublime Patagonian Pinot Noir or bursting Bonarda from the arid mountains of San Juan. Fluent in both English and Spanish, he finds that an appetite for wine, and learning about it, is truly a global language. Bartender and Sommelier. He helps us define all the do’s and dont’s when setting up your bar and of course, leads a few wine tastings himself! Rolando is from Ecuador where he began his extensive career as a bartender, and has been living in Argentina for 3 years. He is currently teaching at the Argentine Institute for Bartending and works at several popular bars in Buenos Aires.